Aberystwyth is very well known for its starling murmurations on winter evenings, with the birds roosting underneath the pier.They have been photographed no end of times, displaying the fantastic shapes that the huge flocks create in the air, as they gather for roosting. I wanted to try and get something a bit different, so I chose a location on the promenade, very close to the pier, put my camera on a tripod, made the composition that I liked, got everything set up, and waited. There were several other photographers around, with their long lenses pointed skyward. They looked at me, and I could tell that they were thinking I was some kind of a nutter set up in the way that I was. 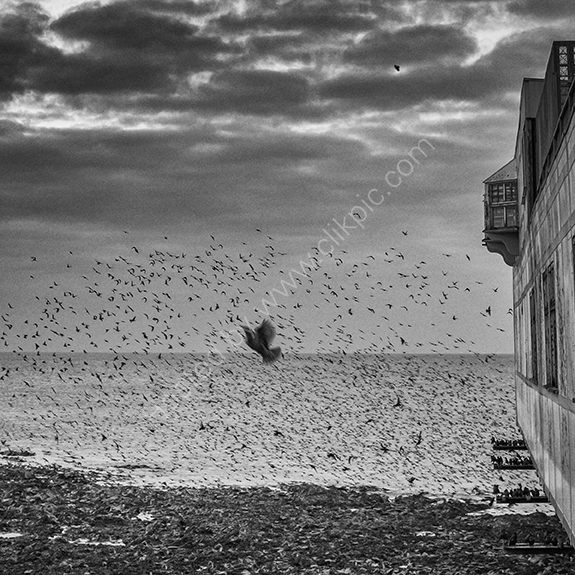 Nevertheless, I'm very happy indeed with this image, captured as the starlings were amassing (a number of birds can already be seen roosting on the bars under the pier), and as a kamikaze pigeon decided to launch itself off the pier, in what appears to me to be a "death dive"!